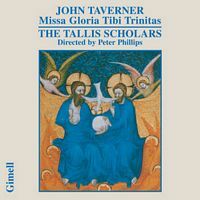 People talk about the virtuosity of Taverner’s Missa Gloria tibi Trinitas; they do not always add that his Missa Corona spinea goes a stage further. The difficulty in Gloria tibi Trinitas is shared out between the six voice-parts its virtuosity is choral. In Corona spinea the difficulty is largely focused in the top part. 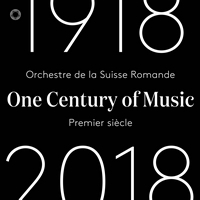 Not only is it uncommonly high, it is also almost constantly present, including two spectacular ‘gimell’ sections, where the part is divided (or ‘twinned’). 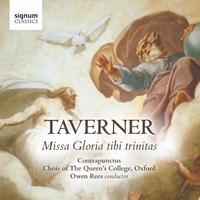 Clearly Taverner was writing for a team of trebles who were quite out of the ordinary and perhaps he had been commissioned to show them off, probably on a very grand occasion. Specially written coloratura soprano parts in opera tend to dominate an evening: it is no different here. No one knows what that occasion was, though the commissioner might well have been Cardinal Wolsey. No one, not even Henry VIII, had a household chapel choir as fine as Wolsey’s, and Wolsey was effectively Taverner’s patron, having founded Cardinal College, Oxford, where Taverner was employed. Maybe Wolsey invited Henry and his queen, Catherine of Aragon, to visit his new foundation in Oxford there is evidence of it in March 1527 where they attended the first performance of this most challenging Mass setting sung by the finest choir any of them would ever have heard. If this is what happened, it soon went wrong for Wolsey. The splendour of the event would have contributed to Henry’s burgeoning jealousy, hastening Wolsey’s fall from favour. It is also not known why such a festal setting should have been dedicated to the Crown of Thorns; nor has the plainchant cantus firmus been identified. The chant itself has a particularly graceful overall shape, the second phrase being a development of the first, and the fourth a brief recapitulation. However, it seems unlikely that the grand occasion would have been a routine service to mark the Feast of the Crown of Thorns (which even then was not held to be an important one). The suggestion has been made (by Hugh Benham) that since Queen Catherine was known to be devoted to the cult of Christ’s passion, one of whose principal emblems was the Crown of Thorns, the Mass was written for her. Her emblem was the pomegranate, a fruit whose top resembles a crown, with the motto ‘Not for my crown’. If this is the connection it certainly suggests that the royal couple were present at the first performance. 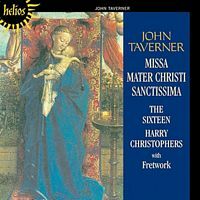 The magnificence of Taverner’s conception can be heard in both the overall structure of the movements, and the detail within the vocal writing. Corona spinea is the longest of all Taverner’s settings of the Ordinary, more than a hundred modern bars longer than Gloria tibi Trinitas. The chant is sung complete in the tenor part ten times in all three statements in the Gloria and Sanctus and two in the Credo and Agnus Dei. As a kind of musical scaffolding it tends only to be stated when all six voices of the full choir are singing, though it does occasionally appear in the reduced-voice sections, of which there are an unusual number in Corona spinea every movement begins with one. 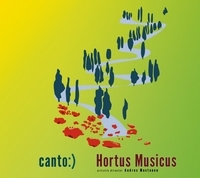 A fine example of this is at the beginning of the Sanctus (track 5), where the tenors sing the chant in very long notes, over which a treble seems to improvise the most abstractedly patterned of lines, almost Arabic in its involutions. This is a section of rare originality, its filigree delicacies contrasting dramatically with the full-choir sound which surrounds it. Similar but more polyphonic are the two extraordinary gimells, which have done much to characterize Corona spinea for listeners in the past: the first in the Sanctus at ‘in nomine Domine’ (track 7, from 0'41"); and the second in the second Agnus at ‘qui tollis’ (track 10, from 1'28" this is a double gimell: the means are twinned as well as the trebles). 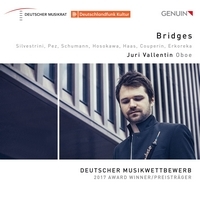 In both cases the basses underpin the weaving of the upper voices, which proceeds with extraordinary invention, as if there could be no end to it. 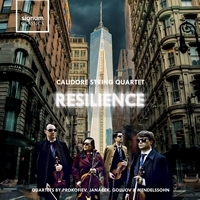 If ever there was writing to illustrate Shakespeare’s ‘music of the spheres’, this is it. 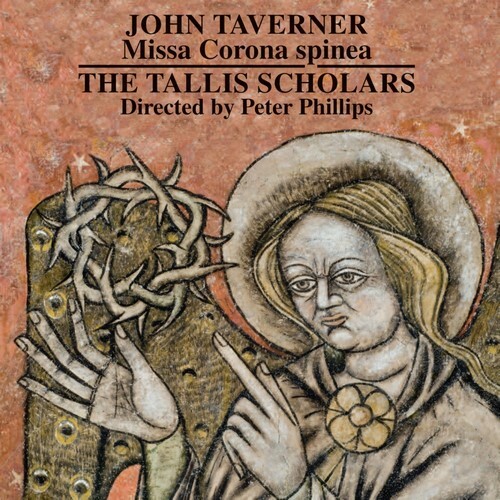 Part of the delight of Corona spinea is that Taverner felt able to ignore the natural boundaries of the text, and experiment with scoring. Repeatedly he starts a full section with the last syllable of the previous solo passage, so that the action is propelled forward. Obvious as this device might seem, it was again most unusual at the time, and contributes to the listener’s sense of excitement. The first example is early in the ‘Gloria’ where the ‘te’ of ‘Glorificamus te’ is attached to the next sentence, beginning ‘Gratias agimus’ and we are thrown from trio into full before we expect it. It happens again at several of the major junctions between reduced-voice passages and full in the subsequent movements. The way Taverner disposes his six voices in Corona spinea also has an air of experiment about it. Instead of the more standard treble, mean, two altos, tenor and bass (TrMAATB), he swops an alto for another bass, giving TrMATBB. This was not unheard of; but what was unusual was to write such a spectacular top part with the doubled low sonorities of the two basses. And it was also unusual to write a top part which much of the time is nearly a clear octave above the part below it. It is as if the lower five voices have been written as a grouping together, over which the treble has been added, operating in its own universe. From this comes much of the energy and excitement of the writing. 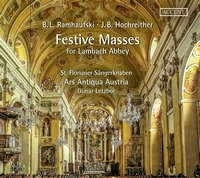 Taverner set Dum transisset Sabbatum the Respond to the third lesson at Matins on Easter Sunday twice. 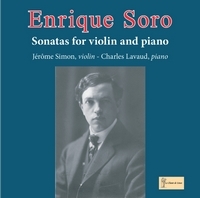 The first has always been the more famous (and was so in the composer’s lifetime) but the second is just as engaging. In fact, since the underlying chant in the tenor is the same melody, the two settings offer a glimpse into how a composer might change his response to a pre-existing part: how he may rework the harmony suggested by the chant notes, or derive points of imitation to fit round those notes. In the end the two settings, though structurally identical, offer quite different interpretations of the possibilities. Yet they both conjure up the same rhapsodic atmosphere, the same sense of space, the same sense of repose from the noisy and insistent world we live in. John Taverner (ok. 1490 - 1545) jest uważany za jednego z najważniejszych angielskich kompozytorów swojej epoki. Był m.in. organistą w Christ Church w Oxfordzie. Zaprezentowana na płycie Missa Corona spinea oraz jedno z najbardziej znanych dzieł kompozytora motet Dum Transisset Sabbatum w dwóch opracowaniach jest odzwierciedleniem jego prawdziwego kunsztu polifonicznego opartego na cantus firmus, który rozbrzmiewa przeważnie w tenorze. Podziwiać możemy także jego melizmatyczne opracowania słów. Przekraczał naturalne granice głosu ludzkiego z zachowaniem niezwykłej aury kontrapunktycznego snucia. Peter Phillips ze swoim zespołem, jakże doświadczonym w tego typu muzyce, przenosi nas w aurę tej niezwykłości, odrywając od tego, co przyziemne i natarczywe. Wokalna metafizyka.